On Dec. 28th we posted about an extraordinarily misleading article published in the Daily Express. 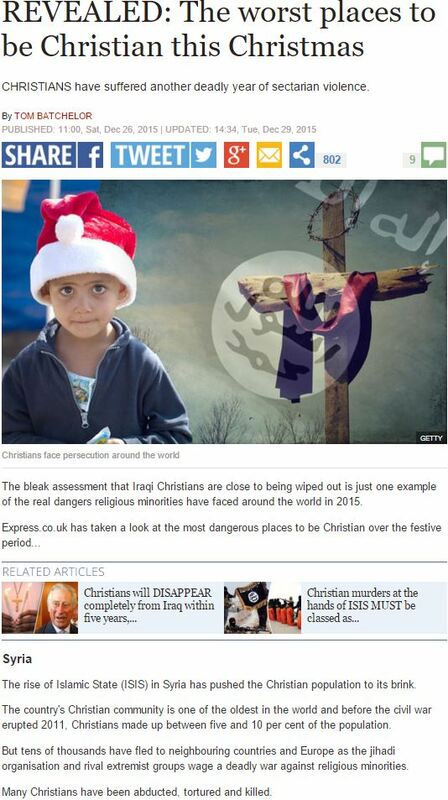 The British tabloid actually put Israel atop a list purporting to “reveal” the “worst places to be Christian during Christmas” – a list which included countries like Syria and Iraq where Christians have of course faced massacres and ethnic cleansing. As we noted, not only is it false to suggest that Israel oppresses its Christian population, but the truth is that the Jewish state is the only nation in the region whose Christian population is in thriving, and where the rights of this beleaguered Mid-East minority is consistently protected. Following our post, we complained to Daily Express editors and tweeted the journalist responsible for the article. Our post got a large number of social media shares, including this tweet from Father Gabriel Nadaf, the spiritual father of the Aramean Christian community in Israel and a promoter of Christian IDF recruitment. This morning, we noticed that the Daily Express responded to our criticism, and completely removed Israel from their list of ‘worst places to be a Christian this Christmas’. Thanks to all of you who tweeted and shared our complaints. CAMERA letter in LA Times: Where’s Coverage on Islamic Threat to Bethlehem? Excellent work. Thank you for your persistence with the British Anti-Israeli media. Kol Hakavod. Great Work with quick results Adam. Thanks to Adam and all who wrote in, it does need to be addressed immediately or it takes on the realm of ‘truth’. But did they apologize in print for their original assertion and advise their readers that it was untrue? No, not yet. I’m going to follow up on this and try to get at least an addendum printed at the bottom of the article. Perhaps you might suggest they run a parallel piece on “Revealed: the worst places to be a Jew this Christmas”. You’d be amazed how many coincide with the places where Christians are persecuted. Cool to see Father Naddaf backing you up. There are far too many Christian prelates out there without the guts to say anything which might upset the persecutors. Some of them seem to agree, at least as far as those pesky Joooz are concerned. I wish that I could see the tantrum that poor little Miranda must be throwing. Adam, you did more for Israel’s image with that article than the Israeli Information Ministry has managed to do with all its resources. Which is not a real challenge to be honest, as Israeli government ministries are achieving diddly squat in these matters. Well done! Kol hakavod to you. The fight goes on and on. The lies come from the right and the left. Good work. Maybe they can now add the Palestinian Territories. What’s really funny is that Bethlehem is referred to as being the West Bank whenever an article discusses something Israel may be doing, such as arresting a terrorism suspect. However, when they want to quite about the discrimination against Christians it is suddenly Israel. It’s too bad our favorite trolls (specifically Gabriel W. and Miranda B.) haven’t bothered to show up on this thread. But I guess after doubling down on the view that the asinine original Daily Express info was valid, trying to keep that up after the DE smartly replaced dogma with facts was simply a bridge too far. Miss ya lots, losers.